While beach chic might seem like an effortless look for guys tying the knot on the sand in a tropical destination like Thailand, there are plenty of style potholes to be avoided by grooms and their groomsmen. You don’t have to search very hard to find a wealth of fashion tips advising beach brides how to strike the right balance between seaside chic and boho beauty… but what about beach style advice for the groom and his best men? When it comes to seaside looks for the guys, there are plenty of fashion faux pas to avoid so it’s best to do your homework before deciding on an outfit so that you strike the right balance between a relaxed tropical look and something a little more special to mark the occasion. Whether you are planning a formal ceremony or a more relaxed affair with the sand between your toes; below are a ideas for grooms and groomsmen to help craft the perfect beach wedding ensemble. Don’t forget the golden rule when dressing for the tropics: comfort comes first – unless, of course, you want to end up overheating in a tailored suit before the wedding even begins. If you’re planning a beach wedding in Thailand, you should prepare for the heat by opting for light clothing choices. That goes for colours too because white, light grey, soft blue and pale beige reflect the heat of the sun, which will help to keep you cool for longer. Linen or cotton will also feel more comfortable against your skin than synthetic fabrics that contain polyester. An increasing number of beach grooms are opting to ditch tailored suit trousers in favour of three-quarter length cut-offs or even striking Bermuda shorts. Shorts will give you more mobility and flexibility at the wedding, even allowing you to go paddling in the surf with your new wife after the ceremony. If you don’t want to go the whole hog and say your vows in a pair of Bermudas, simply roll up the hems of your trousers a few inches over your ankle for a casual beachy vibe that can be transformed into something a little more formal later on. If you want to shake things up a bit, banish the ties and introduce a pop of colour with a floral shirt instead of a tailored waistcoat. 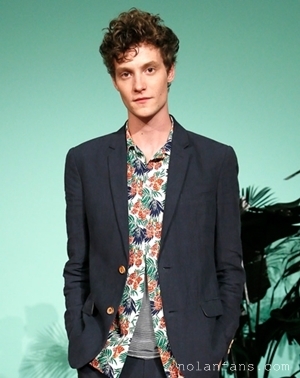 Not only do colourful floral prints work well if you are going for a tropical feel, but the cut of a short sleeved shirt underneath your regular suit jacket helps create a more relaxed, informal silhouette. This look has been seen all over the red carpets this season, as sharp celebs don elegant floral shirts to give their ensembles a stylish edge. However, avoid anything too garish unless you are going for the novelty effect. 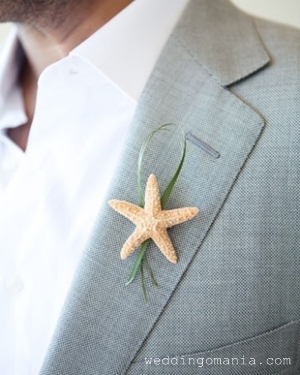 If you thought that the boutonnieres worn by you and your groomsmen must fowers, think again. Tying the knot on the beach provides the opportunity to break away from tradition entirely, and opens up a whole new world of materials when it comes to creating these decorative trinkets. A simple starfish effect works well if you are going for a minimalist look, which you could also achieve by using seashells gathered from the beach adjacent to your private villa. Other beachy materials could include simple twine, burlap or even blue and white striped deckchair material. One of the most blissful things about a beach wedding is being able to revel in the heavenly sensation of the soft sand beneath your feet. Letting the refreshing ocean breeze reach them too will help you stay cool, so it's a good idea to leave the shoes in your room. Of course, a pedicure is advisable if you plan to kick off the footwear, or if you don’t want to go completely barefoot, then you can maintain a casual vibe by donning a smart pair of leather sandals.